View More In Disco Ball Lamps - Page 5. 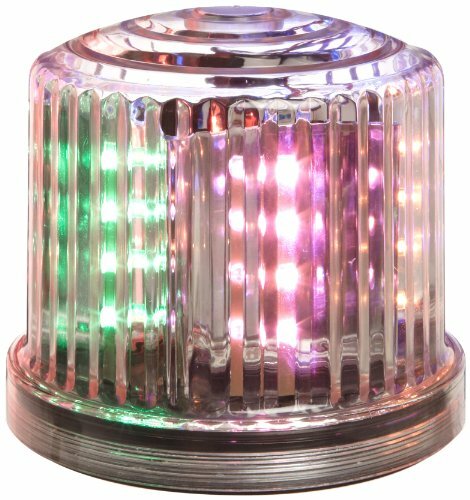 The Fortune PL-450MUJ battery-powered Ultra Bright LED beacon contains 20 LEDs, is multicolored, and can be used as a party decoration or in an industrial setting to increase visibility, attract attention, or signal an alert. The 20 LEDs are arranged to simulate the rotation of a police beacon. The rotation speed can be adjusted to suit the application. Magnets on the bottom allow the beacon to be attached to a vehicle or a metal surface. The beacon's dome screws down against an O-ring gasket to resist water. The beacon can run continuously for up to 40 hours on four AA batteries (sold separately). A 4.5V DC jack allows the beacon to be used with a Fortune Products ADAP-LLAS1000 variable power adapter, a Fortune Products BPP-331 battery power pack, or a Fortune Products BPP-3201-4 battery power pack (each sold separately). The beacon measures 5" high and 5" in diameter. Fortune Products manufactures battery-operated lighting products for special events, seasonal decor, and interior design. The company, founded in 1985, is headquartered in Lake Stevens, WA. If you have any questions about this product by Fortune Products, contact us by completing and submitting the form below. If you are looking for a specif part number, please include it with your message.